Time: 6 hrs. 60 mins. Ice Lake is located in the San Juan National Forest near Silverton, Colorado. The trail starts below treeline near the South Mineral Campground at an elevation of ~9,800 feet. From there it is a steady uphill climb to the Lower Ice Lake Basin and then to the Upper Ice Lake Basin. 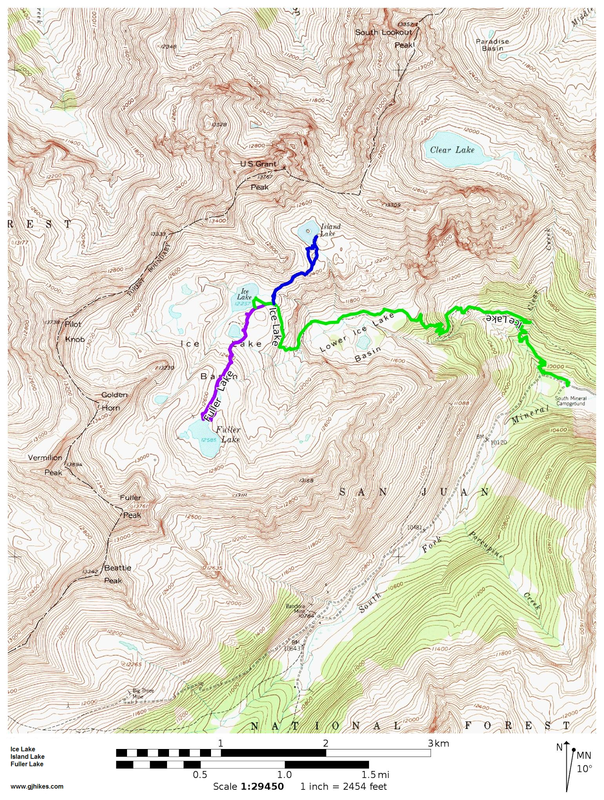 Once at the upper Ice Lake (12,200) there is the option to continue on to Fuller Lake (12,600) in one direction or to Island Lake (12,420) in the other direction. The Ice Lake trail is very popular with backpackers that normally camp in the Lower Ice Lake area which is just below treeline and then spend a day or two exploring all 3 of the lakes. To get to the trailhead drive about 2 miles north of Silverton from the intersection of Highways 550 and 110, or about 20 miles south of Ouray on Highway 550, and turn west onto County Road 7. Follow CR 7 for 4.4 miles to the trailhead which is across the road from the South Mineral Campground where you will also find a restroom. There is a sign for the Ice Lake trail where it begins at the west end of the parking area. From the parking area the trail begins its climb as it heads into the trees. The trail winds its way up a number of switchbacks wasting no time at all in gaining elevation. A few places are a little rocky but there is also plenty of nice smooth trail to hike. At the 0.62 mile point the trail crosses Clear Creek where you can look up and see a waterfall cascading down the mountain. At the 1.08 mile point the trail reaches the upper area of the waterfall where you can walk over for a closer look. This point is also a junction where another trail that crosses a pass above Island Lake and drops down the west side of the the range to a point near Ophir begins. 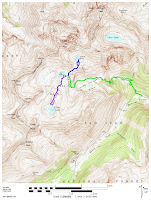 We haven't hiked it yet but is should also serve as an alternate route to Island Lake. Eventually the trail leaves the shelter of the trees for a while with the opportunity to catch some views of the surrounding area. As the trail reenters the trees it climbs a series of switchbacks that take it up to the level of the Lower Ice Lake Basin. Once the trail enters Lower Ice Lake Basin, (11,500) around the 2.8 mile point of the hike, the first glimpses of the tops of the peaks that form the cirque around the upper basin and lakes come into view. Off to the left of the trail Lower Ice Lake sits right at the edge of the treeline. This point marks the last area where you can safely set up camp that has any shelter from passing storms. We did see a few camps around Island Lake that were out in the open but a tent doesn't offer much protection against lightning. At the top of the basin you are treated to the view of a nice waterfall on the right where the creek is spilling over the cliff from Ice Lake. After crossing the creek there is another waterfall that the trail climbs above that has its source at Fuller Lake. The white rocks in the creek look like ice cubes. We don't know enough geology to say whether the rocks have an oxalate or carbonate stain but one geologist that we spoke with suggested a carbonate source was likely but without a specimen he couldn't confirm anything. The creek above the waterfall is much more spectacular with almost a completely white bed of rocks. The obvious speculation is that is what gives Ice Lake its name. After crossing the creek the trail gets a lot steeper as it climbs up the cliffs that form the head of the lower basin. We saw someone try to take a horse up this section of trail but had to give up and turn around. A mule would have been a better choice for the rocky cliff. Once you get above the cliff the trail gets a little confusing as it goes through some knee to waist high brush. Beyond the brush the final climb to the upper basin becomes apparent and while it is still a little steep it is much easier to manage. The water in Ice Lake is a beautiful blue like that found in the lakes at the base of many glaciers. The best views of the lake and the upper basin come from vantage points along the Fuller Lake and Island Lake trails. This picture was taken from the Fuller Lake trail. The massive mountain sticking up above the ridge on the north side of Ice Lake is Ulysses S. Grant Peak (13,767). It forms a dramatic backdrop to Island Lake which sits in a basin at its feet. The view from the Island Lake trail doesn't show as much of Ice Lake but it does have a nice look at the ridgeline and peaks that encircle the basin. The Golden Horn (13,769) is in the middle with Pilot Knob (13,738) being the highpoint of the ridge on the right and Vermillion Peak (13,984) to the left of Golden Horn and Fuller Peak (13,761) to the left of that. Beattie Peak (13,342) is just out of the picture on the left. Ice Lake and its companions rank right near the top of the most beautiful places that we have ever been to. That includes the many places that we have been to in Colorado and the rest of the southwest as well as 3 years that we spent exploring Alaska and driving the Alcan Highway both ways. On this outing we also hiked up to Fuller Lake and then to Island Lake before returning to the trailhead. We ended up taking so many pictures that we decided to break it down to 3 separate posts so we could share more of them. Whether you are able to do all 3 lakes in one trip or need to come back more than once you are sure not to go home disappointed. If you would like to see it for yourself then all you have to do is 'Take a hike'.